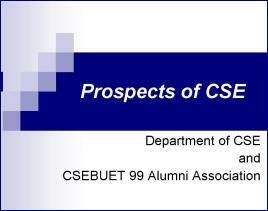 This document was prepared as a leaflet for the seminar 'Prospects of CSE' organized by Department of CSE, BUET and CSEBUET 99 Alumni Association. The seminar was held on November 26, 2005 at the BUET Central Auditorium. »You cannot be a computer engineer simply by doing an M.Sc. in CSE. »Every software you develop is something new. »Easy to do new things compared to other costly/stagnant subjects. »There is no single 'perfect' way to implement some idea. 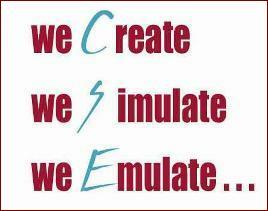 »Other engineering disciplines depend on CSE. »More than 47 students from 96, 97, and 98 batches (total 162 students) are studying abroad now. »More than 6 BUET CSE graduates are now faculty members in US or other foreign Universities. »CS graduates from some private universities are facing problem to find job for poor performance. »No problem faced by good engineers from private universities. »BUET CSE graduates are absorbed in job market even before their results are published. »IT manager, System Manager, System Analyst, MIS officer etc. in Corporate.